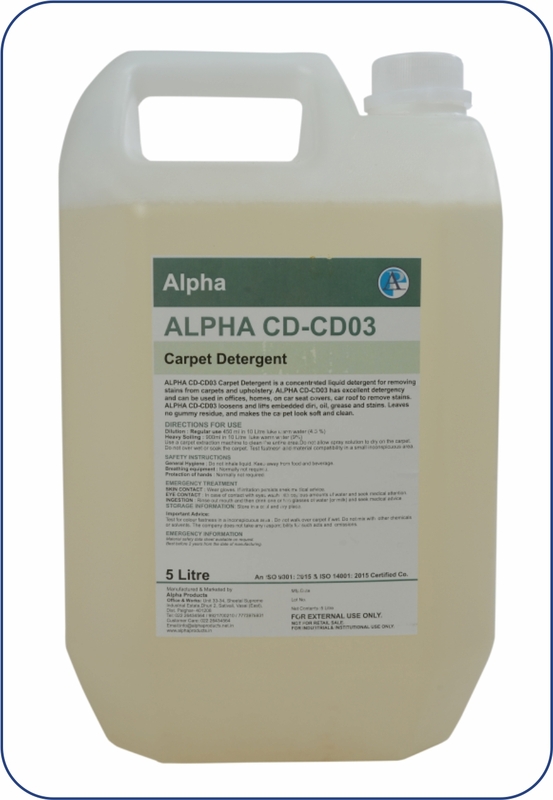 ALPHA- CD- CD03 Carpet Detergent is a concentrated liquid detergent for removing stains from carpets and upholstery. ALPHA-CD-CD03 has excellent detergency and can be used in offices, homes on car seat covers, car roof to remove stains. ALPHA- CD-CD03 loosens and lifts embedded dirt, oil grease and stains leaves, no gummy residue, and makes the carpet look soft and clean. Use a carpet extraction machine to clean the entire area. Do not allow spray solution to dry on the carpet. Do not over wet the carpet or upholstery. Test colour fastness and material compatibility in a small inconspicuous area.